All patrols practiced what was known as on-going information. 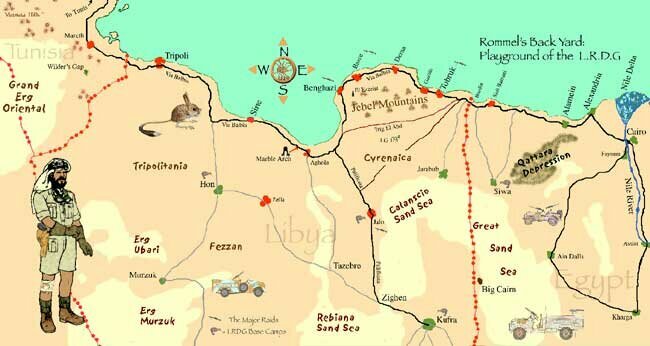 This referred to checking out any new routes the LRDG traversed as well as checking on enemy action with the area. On-going information also required some ingenious foot recons in the area. For instance on one occasion a patrol needed to reach a site that could not be reached on foot due to the distance they would need to travel yet at the same time there was no feasible way to approach by vehicle without being spotted. The solution was to bring a few friendly Arabs to within "camel" distance and then insert them into the area. Intelligence gathering and surveying went hand in hand with reconnaissance. Intelligence gathering was concerned with finding the enemy and seeing what they were up to. This often meant deep travel behind the lines where the LRDG would watch enemy troop movements for long periods of time. This was called Road Watch. It was hard work in which the results of the action were not often immediately recognized by the troops on the ground. Part of this work involved keeping a track of every vehicle that passed by a given location. The LRDG had special binders made up which include silhouettes of enemy vehicles which made it possible for the recce team to simply tick off how many of a given vehicle passed by at a specific time. These binders would were vital for the success of their missions but also could prove devastating is the enemy found them. For this reason, the LRDG knew that if they were to be captured, the binders needed to be destroyed or hidden from the enemy. According to The Other Desert War, not a single binder was ever captured by the enemy. Even when in engaged in direct action missions, the LRDG still kept their primary mission of intelligence gathering as a secondary mission. Surveying primarily focused on checking routes for the possible future use. The LRDG had a small survey section commanded by Ken Lazarus that did nothing but chart the desert. It comprised two or three vehicles and would go out for weeks at a time and chart new areas of the desert. On one surveying mission Bernard Bruce, leader of one of the Guards patrol covered over 3,500 miles of desert. Lloyd Owens mentions in his book, that sometimes a patrol would go out with nothing more than a blank sheet of paper with lines of latitude and longitude drawn on it and then proceed to chart what they came across. When they weren't making new maps, a patrol would have to correct the issued maps. The LRDG was also instrumental in surveying the desert in order to plot enemy locations, and provide up to date information for the maps used by the British army. The LRDG acted as pathfinders for other special forces such as the SAS as well as leading conventional forces through the rough the desert. They also provided training for navigators for the SAS and regular forces. In the early part of the war the LRDG acted as couriers between units and also acted as a taxi service for the Intelligence Agents and the SAS. 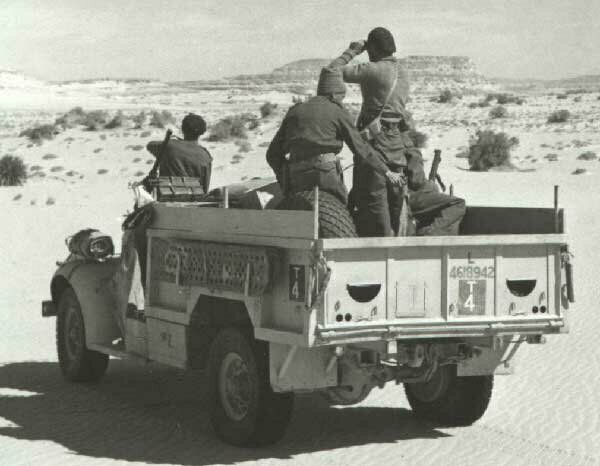 Later the SAS received their own vehicles but the LRDG still provided insertion capabilities for special operatives. Wavell referred to the LRDG as his mosquito columns. One of their principle direct action duties involved harassing raids on important targets. The such missions were later also conducted by the SAS (who enjoyed raiding airfields). Where as the SAS tended to go guns blazing down the middle of an airstrip, the LRDG tended to lay mine fields, set up ambushes and occasionally commit a small raid on an important priority target, sometimes in conjunction with other commando and special operations units. However, because their main mission was to gather intelligence, the direct action capabilities were often kept in check. The idea was for the enemy not to even know the LRDG had been there when on reconnaissance. Thus an ambush would not take place where a successful road watch was employed. The LRDG was also sometimes used as part of of large scale raids. For the most part, they were not really designed to operate in such a fashion and the raids met with only marginal success.